For those who don’t know about Disaster City®, allow me to enlighten you. Disaster City® waits, tucked away in the woodlands surrounding College Station’s airport. 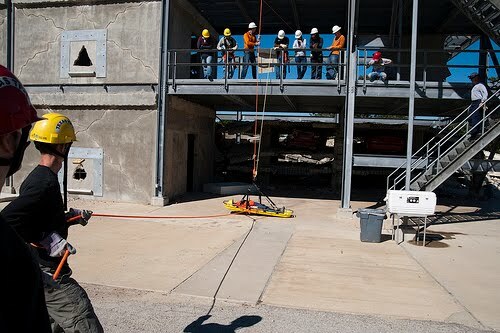 In addition to serving as a training ground for the world-renowned search and rescue team Texas Task Force 1, the facility has two auxiliary purposes. First, visiting rescue professionals utilize the facility for simulation and training exercises under the supervision of TEEX. Second, students and other groups use the facility as an introduction to crisis management and as a team-building exercise. 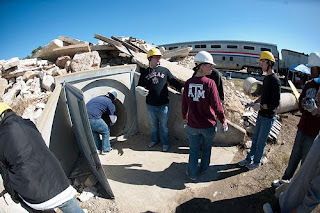 On November 2, 2009, my fellow Texas A&M MBA students and I ventured forth into the sprawling chaos that is TEEX’s Disaster City. Our only expectations? The unexpected. Our day started slow with a review of safety guidelines and a general overview of the planned activities. In retrospect, that first meeting in the command center was like the initial incline on a roller coaster. After breaking into teams and receiving our first assignment, our “disaster” day flew by in a flurry of exciting events. I certainly underestimated the physical exertion required by the various disaster stations, but my body reminded me of that fact for several days after the outing. Though our activities did not involve any live infernos or explosions, I have it on good authority that such events do occur in more advanced training sessions. Our group had the opportunity to conquer such landscapes as demolished buildings, rubble piles, and an old Amtrak train that has been intentionally derailed. The scale of these disasters is naturally limited by the size of the lots at the facility (roughly 52 acres); however, I can assure you that you couldn’t ask for more warped wood, twisted steel, or concrete debris. The search and rescue mission in the Amtrak train wreckage proved to be the most demanding. I certainly did not expect to crawl through a damaged train car and spend an hour coordinating the removal of an individual from an upside down bathroom stall. After spending eight hours in labyrinth after labyrinth, I realized that I hope to never experience any of these disasters as they might occur in the real world. This is not to say that I didn’t absolutely love spending the day at Disaster City, but there were enough mannequins scattered about the facility to give anyone with a decent imagination an idea about the macabre aspects of search and rescue operations. The communication exercises were brutal. I have a newfound respect for the work of Texas Task Force 1 Public Information Officer, Brian Smith. When I visited Mays Business School in the spring, the second year students showed a tape of their TEEX Disaster City excursion. Even with prior knowledge of the presence of film crews, I was not prepared to answer the pointed questions. I felt like the reporters were constantly trying to back me into the proverbial corner and that I was letting them succeed. Despite the challenges, interaction with the pseudo-reporters yielded a hilarious blooper reel which has been sworn to secrecy by the Class of 2011. I will honor this commitment by not revealing any names, but I will disclose that some of my peers displayed an uncanny aptitude for misdirection. In addition to practice with the press, the day afforded our new MBA teams plenty of opportunities to get to know each other, and round-robin leadership responsibilities previewed our different management styles. The most significant lesson from TEEX Disaster City is the importance of precision in crisis situations. Successful crisis management requires not only accuracy in rescue operations but also care in communication. 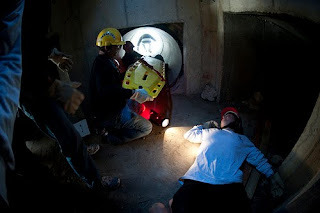 Wasted effort during a rescue can result in delays in locating victims which may ultimately result in unnecessary loss of life. Likewise, revealing excessive amounts of information to the media may be misleading and detrimental to ongoing operations. Undoubtedly, all aspiring business executives can benefit from understanding how to focus the efforts of an organization and deliver a clear, concise message internally and externally. I look forward to expanding upon my TEEX Disaster City experiences and honing both of these skills in the coming months and years. 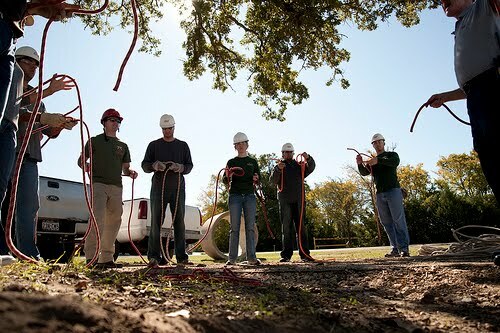 The Texas A&M MBA class of 2011 has incurred a debt to TEEX that can never be forgotten. Not only did the knowledgeable staff provide an exciting daylong adventure, but they also emphasized how the lessons from the event can and should be taken at more than face value. Very few, if any, of my colleagues will become members of a professional search and rescue operation. However, if our future employers were to experience a calamity requiring such a team, at least we would be cognizant of the operational process. 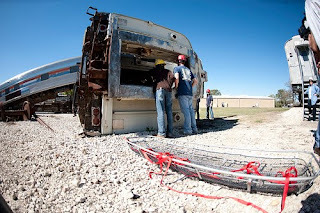 Additionally, TEEX Disaster City is a proving ground where exposure to challenging physical activities reinforces the fact that the intangible qualities of leadership persist in all things we do. 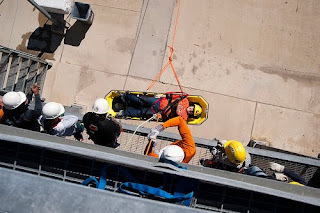 Once again, our thanks go to TEEX for facilitating an irreplaceable, once-in-a-lifetime experience. John Lineberger is an MBA Candidate at Texas A&M's Mays Business School, Class of 2011.